Due to a landslide on portions of Birdsall Road and boat launch area, the area has been closed to all public entry. The closed area is approximately .58 mile east of the beginning of Birdsall Road to the North Fork of the American River and includes vessel launching and take out. The next available river take out is approximately 1.25 miles downstream at Oregon Bar. This closure will remain in effect until the area can be safely reopened and/or repaired. The North and Middle Forks of the American River provide boaters with a quality wilderness experience. Swift currents and unseen dangers can provide boaters with unwanted emergencies. These rivers are not for beginners, quite often experienced boaters have trouble on them. Respect the river... and come well-prepared when you visit. The 4.0 mile river run from the Iowa Hill Bridge to Yankee Jims provides several Class IV - V rapids, most notably: Chamberlin Falls, Staircase Rapids, and Bogus Thunder. Two class II - III segments from Yankee Jims Bride to Ponderosa Way Bridge and from Ponderosa Way Bridge to Upper Lake Clementine. Each offer a beautiful 4 mile boating experience. Trips down this river are typically made in one day. Boating the North fork requires a sound background in technical whitewater skills. The most desirable flow range is between 1,500 - 3,000 cfs. One, two, or three day trips are possible on this challenging scenic river. The 15 mile run from Oxbow put-in to Greenwood take-out features several Class IV rapids, as well as numerous Class II and III rapids. Most notable are the Tunnel Chute and Kanaka Falls. A seven mile trip from Greenwood access area to Mammoth Bar offers a wonderful Class II - III rapids. NOTE: If you are uncertain about your ability to navigate any rapid, PORTAGE! Murderer's Bar Rapid has claimed lives. Class II - Novice. Straightforward rapids with wide, clear channels. Class V - Expert. 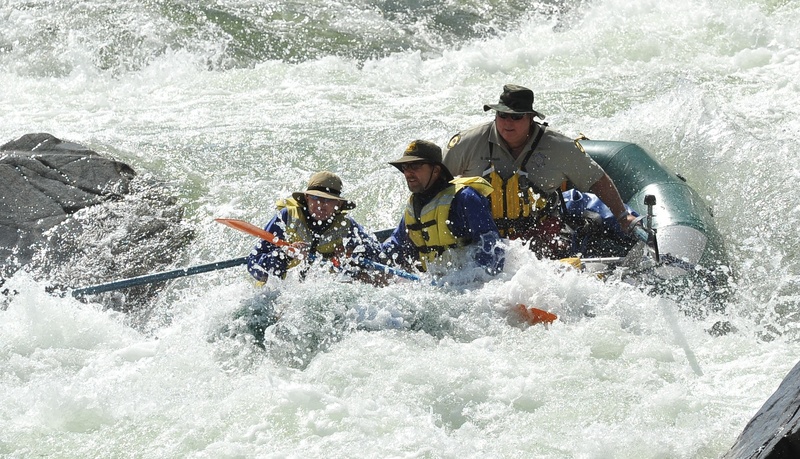 Long, obstructed, or violent rapids which expose paddlers to above-average danger. For further information contact the Whitewater Recreation Office at (530) 823-4162.